Strengthen damaged muscles, correct improper form and return to your maximum level of function with individualized physical therapy plans. Find relief from the pain of bulging, herniated, or degenerated discs with non-surgical treatments at Neck & Back Medical Center. Increase your healing potential with regenerative stem cell therapy to achieve lasting pain relief and improved quality of life. Treat the problem, not just the symptom at Neck & Back Medical Center. We’ll devise a comprehensive treatment plan to relieve your chronic pain. Welcome to Neck & Back Medical Center! 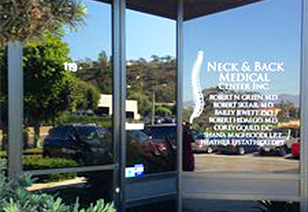 Neck & Back Medical Center treats patients in and around Laguna Hills, California, with high quality care, collaborative treatment methods and state-of-the-art technology. At our clinic, our team of medical doctors and therapists will work together to develop a comprehensive, individualized treatment plan to ease your pain, restore your function and maximize your quality of life. For more than 20 years, Neck & Back Medical Center has provided solutions to patients who failed most other types of treatment. Whether you’re a long-term chronic pain patient, recently experiencing discomfort in your back, or have a sports-related injury you need corrected, we can design a recovery plan for you without resorting to drugs or surgery. Visit our clinic in beautiful Laguna Hills to learn more about our healing methods, or contact us online today to schedule your first appointment. "Our goal is to relieve your chronic back pain and improve your function without drugs or surgery"
Neuropathy is a collection of disorders that occurs when nerves of the peripheral nervous system (the part of the nervous system outside of the brain and spinal cord) are damaged. The condition is generally referred to as peripheral neuropathy. In the United States over 20 million people suffer from peripheral neuropathy. What makes us one of Orange County´s premier medical centers is our multi-disciplinary approach to practicing medicine. Our staff of Medical Doctors and Physical Therapists work together collaboratively resulting in improved diagnoses and outcomes for even the most difficult cases. Under the direction of our medical doctor, our therapists will help restore your optimal level of health and activity. Our approach has always been about the quality of care first, to get you back to health as quickly as possible. Our facility is equipped with the latest technology has to offer such as Med-X computerized back strengthening, cold laser, spinal decompression and other hi-tech modalities. The tools and techniques used in our multi-disciplinary methodology often reflect a different approach to health care that can correct your spinal problem when other methods fail.